Jackie Wiley will soon graduate with her degree in game design and development. In June, she fulfills her dream as an associate game designer for Blizzard Entertainment in California—an experience she has wished for since she was a child. Since she was 11 years old, Jackie Wiley has dreamed of recreating the dramatic fantasy realms in her family’s favorite video game, World of Warcraft. Wiley’s dream becomes a reality when she begins her full-time job with Blizzard Entertainment, the monster game development and publishing company behind World of Warcraft, Hearthstone: Heroes of Warcraft, and the Warcraft, StarCraft and Diablo franchises. Wiley, a native of Flanders, N.J., graduates from RIT in May with her bachelor’s degree in game design and development. 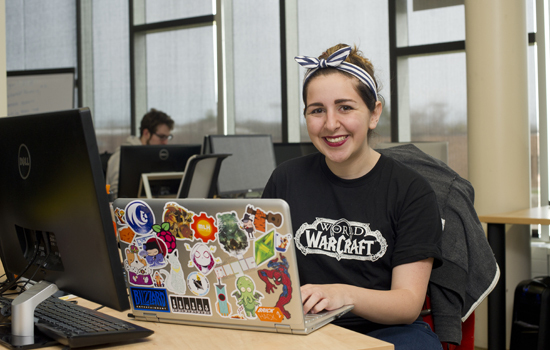 In June, she will head to Blizzard headquarters in Irvine, Calif., and embark upon her professional career as an associate game designer responsible for the storytelling and world design within World of Warcraft. Wiley secured an internship with Blizzard last summer thanks in part to her visit to the Game Developer’s Conference in San Francisco, Calif., a showcase of the industry’s groundbreaking gaming products and a forum for students looking to secure co-ops or permanent positions with leading developers. Each year, RIT’s Center for Media, Arts, Games, Interaction and Creativity (MAGIC) arranges for students to attend. Wiley is also proud to be a woman making waves in the male-dominated gaming industry. Wiley is already making inroads to help make her next dream come true. MIT Technology Review talks to Evan Selinger, professor of philosophy, about Google's AI principles.